"The Mandelbrot Set," an acrylic painting by Maureen O'Keefe, of Sidney, was one of 10 pieces that won her an Ohio Arts Council Individual Artist of Excellence award recently. Maureen O’Keefe, of Sidney, puts varnish on a recently completed painting, at her home, Thursday, April 4. SIDNEY — Sidney artist Maureen O’Keefe has received an Individual Excellence Award from the Ohio Arts Council. 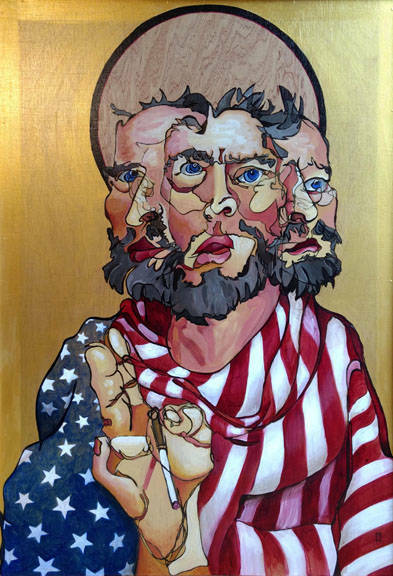 The painter is one of 78 visual artists in Ohio who each won a $5,000 grant. O’Keefe plans to use the money to acquire space for a studio. 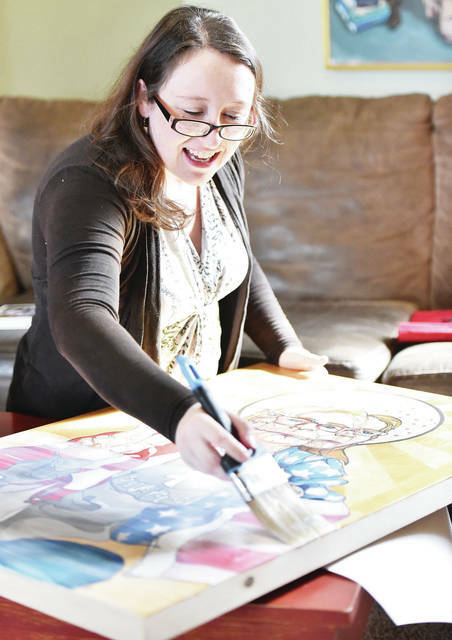 Until now, she has been creating her award-winning art on the floor in the living room of the home she shares with her husband, Dylan, and their daughters, Scarlett, 11, and Mia, 9. That means moving everything the family might be doing out of the way and putting down a blanket to protect the carpet from paint. “It takes me a third of my working time to set up and tear down and not be in the way of our life,” she laughed. Employed part time in gift shop inventory control at the Dayton Art Institute, O’Keefe usually spends all day on Mondays and Tuesdays painting at home. She didn’t set out to be an artist. She had enjoyed drawing; had learned a lot from her mom, Karen Potts, who was a theater artist; had taken private art lessons from Tim Seewer when she was a child and continued painting in high school, but her plan was to become an English teacher. It was the late Anne Vaccaro, the chairperson of Edison State Community College’s art department, who changed O’Keefe’s career. “I always, always, always loved art,” O’Keefe said. Vaccaro saw talent in O’Keefe’s work and suggested she further her studies at the Savannah College of Art and Design. She did. O’Keefe graduated with a Bachelor of Fine Arts in 2005. Since that time, she has enjoyed several solo exhibitions of her work in Georgia and Ohio and been in group exhibitions in North Carolina, Ohio and Pennsylvania. She is not represented by a gallery; although, she is a member of The Contemporary in Dayton. Because gallery owners are in the business of making money, they sometimes encourage artists to paint what will sell. “My goal is to show work. I want to make the work that I want to make,” O’Keefe said. That doesn’t mean there aren’t buyers for the portraits she creates. Her art is in private collections in five states. O’Keefe begins each of her paintings by drawing shapes on the wooden panels that are her canvases. She steadfastly looks at her model as she draws. She never looks at the panel and she doesn’t lift the pencil, so the drawing is one continuous line. It’s a method called blind contour. When the contour is finished, “then I can look at it,” she said. “Sometimes it’s in the right place or not. Sometimes, I cut the panel (so that the position of the figure is correct). Then I paint over the pencil lines and fill in with color,” she added. O’Keefe works exclusively with acrylic paint. 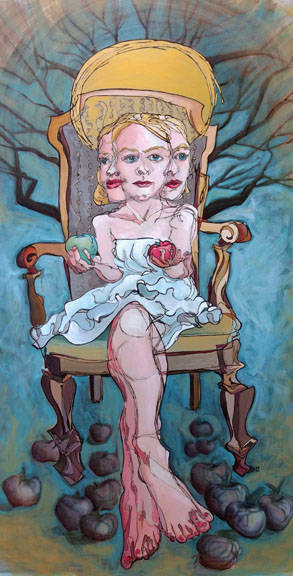 Her recent work illustrates the many sides any one person has. “I like to analyze people and why they do what they do, so the portraits have always been about that. 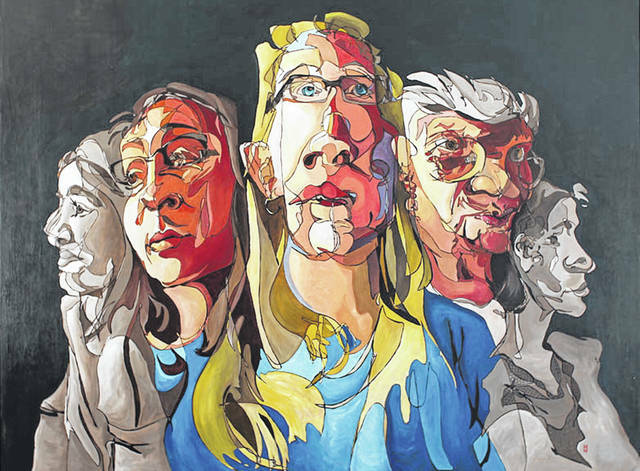 People present different identities in different situations, so some (portraits) will have several heads or faces,” she said. One inspiration for her was the Renaissance practice of picturing the Christian holy trinity as one person with three heads. Family members and friends are her usual models. She has paintings in five series in various stages of development right now: totems, trinities and spirits, abstracted bodies, diptychs and objects of devotion. “I’m always going for a balance between realism and abstraction. I surprise myself. You’re constantly making adjustments for what’s happening on the surface. You’re constantly adjusting the image so it’s communicating the right idea. I get in a zone and will be working, and then I step back and look at it, and I’ll think, ‘Where did that come from?’ You work, work, work, work, work, and then some days nothing comes of it, and sometimes, I get it right. It always surprises me when I get it right,” she said. Even though this artist has won multiple awards, she revealed that recognition also surprises her. “When someone buys a piece or remembers me, then I’m surprised,” she said. The Individual Excellence Award is “peer recognition of artists for the exceptional merit of a body of their work that advances or exemplifies the discipline and the larger artistic community,” said the Ohio Arts Council in a press release. “I’m super grateful for the grant and to everyone in the state that supports the arts. I’m excited for whatever opportunities this brings,” O’Keefe said. Scott, too, is pleased for one of her “favorites in this area. I’m looking forward to following her success,” Scott said. "The Mandelbrot Set," an acrylic painting by Maureen O’Keefe, of Sidney, was one of 10 pieces that won her an Ohio Arts Council Individual Artist of Excellence award recently.